The meteoric growth of the 3D printing software industry over the last few years shows no signs of slowing down. According to a new report conducted by BIS Research, the global market for 3D printing software and services will grow to $4.52 billion by 2021 – reflecting a Compound Annual Growth Rate (CAGR) of 25.2%. Increasing demand for software and services across range of industries, including medical, automotive and aerospace & defence, is just one of the factors in the rapid growth of this sector. The crucial role of software within the additive manufacturing process means that it is important for companies to leverage this to their advantage by choosing the correct software solutions for their needs. The variety of software providers on the market can, however, be overwhelming, which is why it is important for companies to be clear on their uses and needs before implementing a software solution. The market intelligence report, entitled Global 3D Printing Software & Services Market, Analysis and Forecast (2017-20121), highlights the emergence of design/modelling, data preparation, simulation and machine control software as the main applications that have opened up new ways for engineers and designers to create and manufacture objects using 3D printing technology. 3D design and modelling is by far the most common application of software in the additive manufacturing industry, with a 61% share of the global 3D printing software and services market as of last year. 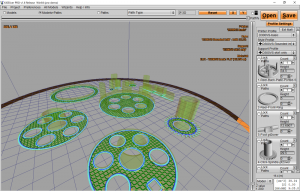 Used across a range of industries, 3D modelling software is now an essential part of the digital production process. However, the large variety of 3D CAD/design software on the market means that it can often be difficult to find the right software for your company. It is therefore important to carefully choose your CAD/design software based on your printing and workflow needs. Popular professional options for 3D CAD/design software include Blender, Rhino3D, SolidWorks and AutoCAD. While much progress has been made in improving 3D printing technology, it is still often difficult to predict how a part will be printed. Very often, a part may have to be printed multiple times before it is the desired result is achieved. With regard to metal 3D printing, for example, heat cause the metal to melt in unexpected ways, and deformities can occur due to stresses caused by rapid heating and cooling. One possible solution to the problem? Simulation software that can predicts both the printing process and the performance of the part. And yet there are currently few companies working on simulation software technology for the additive manufacturing industry. One company that has been leading the way, however, is 3DSIM, which develops simulation software for metal additive manufacturing. 3DSIM’s software includes exaSIM, whose predictions help to identify residual stress, distortion and build failure – eliminating the need for physical trial and error. With the recent acquisition of 3DSIM by ANSYS, a computer-aided engineering software developer, it will be interesting to see the impact that this will have on the development of simulation software in the future. It is no secret that the preparation of 3D CAD files before the printing process can be a time-consuming and laborious process. Files often need to be corrected of a number of errors, including noise shells, overlapping surfaces and holes in the mesh – all of which will prevent your file from being printed. Finding the right software that can verify and correct any errors is therefore an important way of saving time and ensuring that your 3D model is printed correctly. This category encompasses 3D printing slicing software. A vital component in the 3D printing process, slicing software is effectively the link between your 3D model and the printer. Slicing software prepares the 3D file for printing by generating a G-code and “slicing” the file into layers, ensuring that a path is created for the print head to follow. Slicing software can be used to determine the printing speed and layer thickness to create the geometry of a part. Again, there is a huge range of slicing software that you can use with your printer, from Cura and KISSlicer (good for both beginners and professionals) to Slic3r (aimed at more advanced users). Make sure to assess which slicing software is most suited to your needs. New developments in the 3D printing software sector are inevitable as new end-use applications are found within the additive manufacturing industry. However, one of the challenges facing the market, according to the BIS report, is a lack of technical expertise. With 3D printing software increasingly become a vital component in the additive manufacturing process, it is clear that companies will have to invest more into developing their teams in order to fully take advantage of all that 3D printing software has to offer. And one thing is clear – as the market continues the grow, we are still at the tip of the iceberg when it comes to uncovering the potential of 3D printing software solutions.